Tis the season! The Town of Milliken annually hosts its Festival of Lights celebration in the Milliken Middle School, allowing for Milliken and surrounding communities to get together and celebrate the holiday season. This day full of holiday cheer begins in the late afternoon inside the school, followed by a small-lighted parade and a chili supper hosted by the Milliken Business Association (MBA). Johnstown Senior Center, 101 W. Charlotte St., Johnstown. Featuring a drawing for Radio Flyer Wagon full of toys for boys and girls. Home baked goods, crafts, silent auction. Lunch served 11 am - 1:30 pm. Santa Visit from 10 am - 2 pm. For more information, call 970-587-5251. Picture with Santa, Reading, Singing, Pizza, Cookies and maybe even some other surprises. On Saturday, Dec. 12, you and the kids can enjoy breakfast with Santa! You are welcome to bring your own camera to capture the moments your child spends with Santa. Wish lists will be placed in Santa’s Mailbox and are guaranteed to arrive just in time for Christmas! Preregistration is required. Thompson Rivers Parks & Recreation District is taking registrations for this fun event starting today through Dec. 4. Find more information at http://www.trpr.org/special-events/. The Johnstown Historical Society Christmas House Tour is December 12 from 10-3. There will be 4 houses on the tour, besides the Parish House Museum. The tickets will be $15 each or if you buy two, the third is $12. They will be on sale at Daphne's Boutique, Hays Market service center, or can be reserved by calling the museum at 587-0278. The tickets will probably be available around Dec 1. Bingo every Wednesday night at 7P. 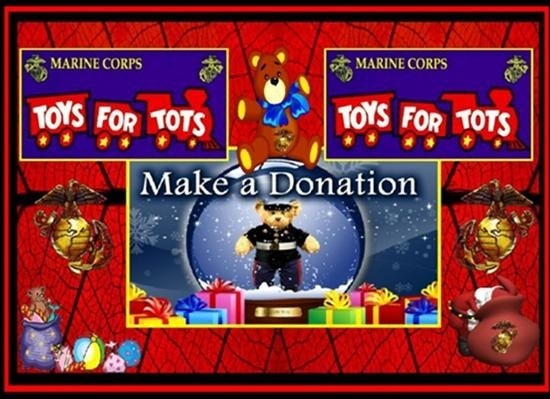 On behalf of the Marine Corps and Marine Corps Reserve, the JM Post invites you to participate in their Toys for Tots Christmas Drive. We have placed a donation box at the JM Post canteen. Please consider donating a new, unwrapped toy for a needy child. The drive will run through December 17, 2015. Please do not donate toys that resemble weapons. Join us for one of Northern Colorado's best holiday traditions! Stroll through the whimsically decorated and twinkling Gardens lit by hundreds of thousands of LED lights. See your favorite perennial flower beds, huge sculptural flowers, a brilliant blue LED pond, John Deere tractor, cornfields, and farmer, and a Primordial Forest with dinosaurs—all created entirely from holiday lights! During the weekends, visit with Santa, listen to holiday music, make seasonal crafts, and enjoy warm drinks. Beginning November 27, holiday plants including poinsettias, Christmas cactus, amaryllis, and unique succulent pots and botanically inspired gifts are also available for purchase in our greenhouse and gift shop. Garden of Lights is dependent on volunteers to make the show happen. Although there is no ticket cost to enter, a $2 per person donation is appreciated.